The Best GSD's in Northeast Texas! We are a small hobby breeder of top quality German Shepherds. 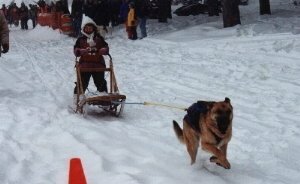 We have been showing our dogs in AKC conformation shows for 20 years. We only have approximately one litter per year, so we can focus on producing the best dogs that are suitable for family companions, performance prospects and future conformation champions. In addition to exhibiting our own dogs, we also provide handling, boarding and grooming services. Pictured is Ch. 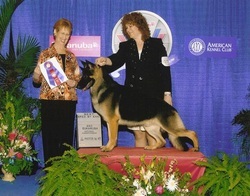 Windmill's Synchronicity--2006 Top 10 GSD in the USA, multiple Group placer and Best Bred By Exhibitor in Show winner. Visit our Facebook pages for the most recent updates and wins! Champion Happy Mar Nash Bridges Of Nordlicht--Our first champion and a Best Veteran in Show winner, stud dog, and an excellent Juniors dog. Our dogs do it all!